From cufflinks to leather belts, a discerning gentleman values the finer details. Elevate your carefully crafted image and update your style repertoire with our selection of Sterling Silver Collar Stiffeners. 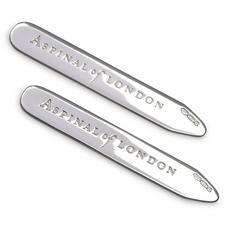 Handmade in England from hallmarked silver, each pair is engraved with the Aspinal logo; a mark of utmost quality. Opt for the luxe appeal of plated mother of pearl or smarten your shirt with understated silver, ideal for coordinating with our range of sterling silver cufflinks. Personalise with initials for a unique touch.